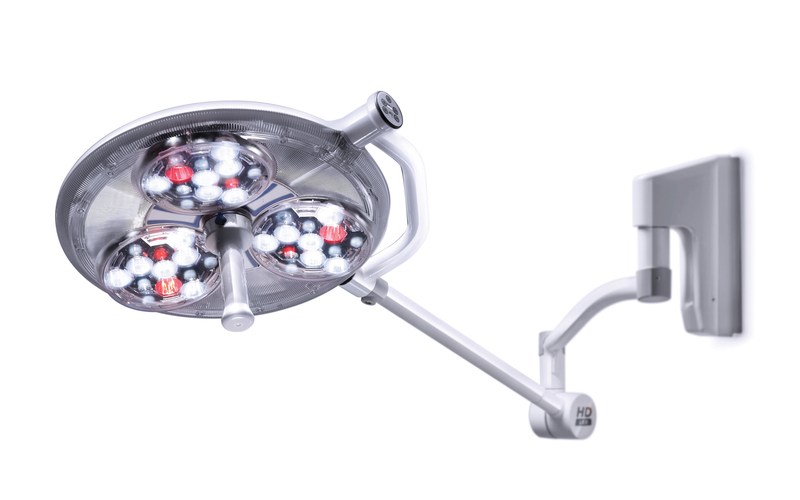 Astramax HD-LED is the first medical lighting product designed with a high colour rendition across the full visible spectrum, allowing surgeons to have uncompromising surgical lighting performance in a highly economical product. 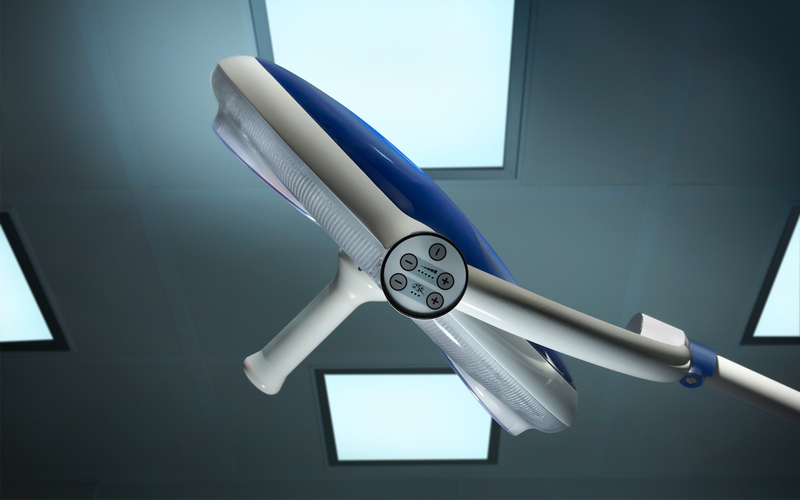 Brandon Medical’s existing theatre lighting range featured cumbersome products CNC’d directly from blocks of aluminium. 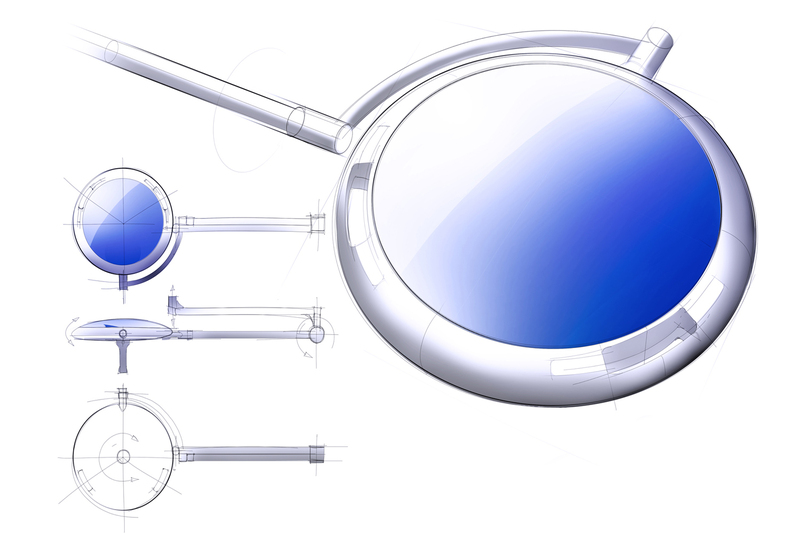 A competitor analysis and market benchmarking exercise helped identify an opportunity for a lightweight, low cost surgical operating light. 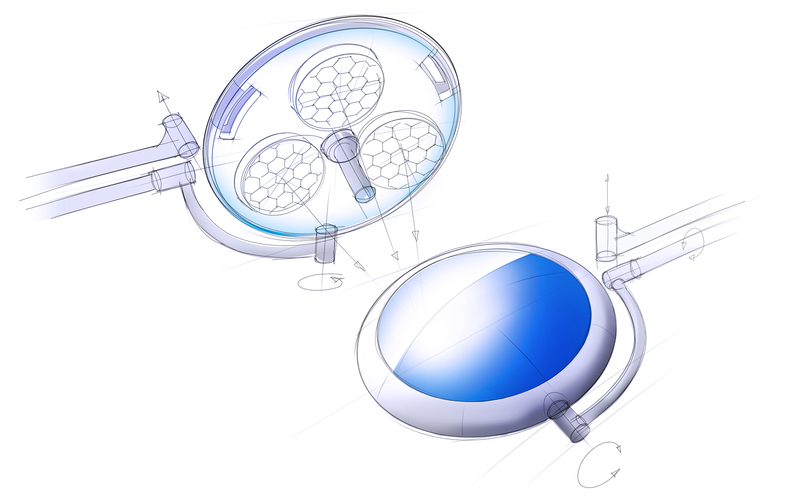 Performance and ergonomic led parameters drove the design aesthetic, with the two developing concurrently. 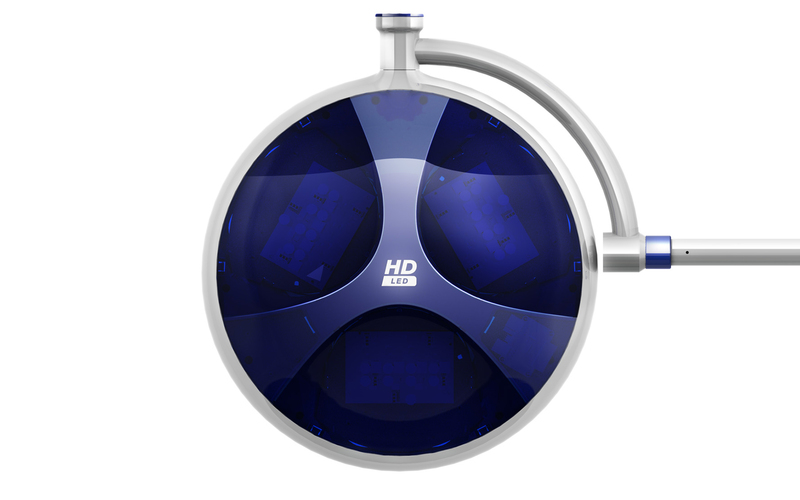 Brandon’s new HD-LED internal technology allowed for a sleeker, lower profile housing than in previous halogen products, which was exploited in the concept ideation. The application of their two-tone blue & white brand identity helped enhance the illusion of a slimmer unit and combined with an intricately fluted clear lens undercarriage, assisted in obscuring the view from an otherwise unaesthetic interior. 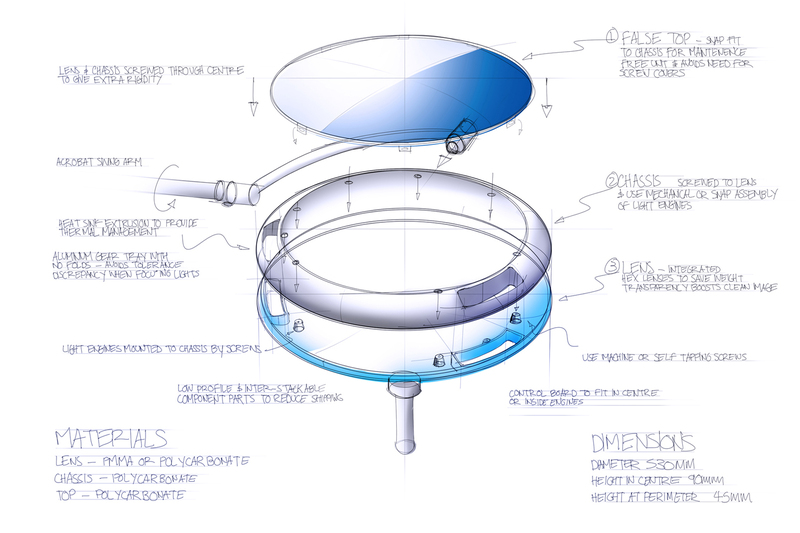 Furthermore, the cellular-like LED lenses were mounted at converging angles to obtain a 1m focus point, driving a concave surface makeup on the lower lens moulding. 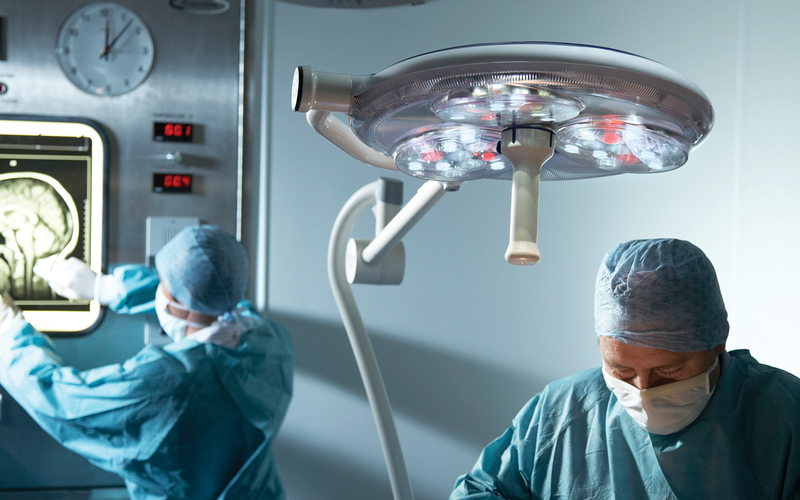 This also removed any risk of a mirror effect on the underside of the product, preventing patients from viewing a reflection of their own surgery. A great deal of work was carried out examining every part’s surface to remove as much material as possible whilst maintaining functionality and aesthetics. Proving out the 4.5kg weight limit of the concept was undertaken inside Solidworks, with studies on mass properties and centre of mass driving decisions on materials and honeycomb wall section designs. All major fixings have been concealed with an intricate lens fluting design that also improves flow of material when injection moulding. The split lines of components were left loose in CAD and then tightened during moulding trials to eradicate dust collection, giving an IP54 rated housing. External components were manufactured in a V0 grade polycarbonate and then hard coated on-site for improved scratch protection and chemical resistance.